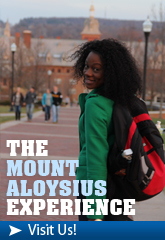 Campus Ministry nourishes the development of religious faith and practice at Mount Aloysius College, while affirming the individual and empowering the community to proclaim the Gospel of Jesus Christ. Campus Ministry respects the religious traditions of the many while expressing the identity and mission of a Catholic college rich in the tradition of the Sisters of Mercy. Campus Ministry participates in every aspect of the college community through prayer, liturgy, community service, and pastoral care and encourages all to integrate personal faith into the academic and social environment of the college. 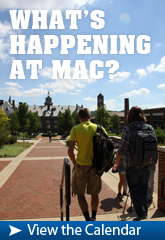 Students are encouraged to develop their leadership skills via two student leadership teams. Members of the Student Ministry Outreach Team (also known as SMOT) lead faith based programs such as retreats, prayer services, liturgies and faith sharing “fostering spirituality peer to peer.” Members of the Social Action Leadership Team (Also known as SALT) are “servant leaders” who implement service projects and social justice related events aimed at fostering creative nonviolence and addressing the critical concerns of the Sisters of Mercy. Campus Ministry fosters global citizenship through mission trips both domestically and internationally. Alternative break experiences provide opportunities for students, faculty, and staff to serve within the United States and abroad during college breaks. Participants are able to developer their spirituality and deepen their relationship with God while living out the gospel values and examining issues of injustice further developing a life-long commitment to working for the common good. Our Lady of Mercy Chapel is located in the Chapel Wing adjoining the second floor of the Main Building. This historic chapel is open daily for meditation and prayer. All students, faculty and staff members are welcome regardless of denomination. 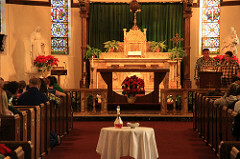 Special services are held at Thanksgiving, Christmas, during Lent and on other occasions throughout the year. 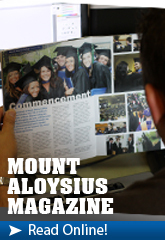 All catalogs © 2019 Mount Aloysius College. Powered by the Acalog™ Academic Catalog Management System™ (ACMS™).